OEL-10 is a universal signal generator designed for driving p-Si AM LCD and/or OLED panels with analog video signal (voltage) inputs. It corresponds to a single-phase to 8-phase color driving. Panels can be evaluated with moving pictures by NTSC and still pictures by internal memory. 32 channels of drive signals can adjust function for phase and rise/fall time. A maximum of 64 different panel data can be programmed. The OEL-10 can generate all the necessary signals to drive LCD or OEL panels. Evaluation with moving pictures by the input of composite signals or S-video signals. Easy setting for output voltages of panel circuit power supplies, video signal amplifiers, and drive signal amplifiers. Phases can be swapped for left-right inversion display of video signals. Step is automatically forwarded in a certain interval and outputs trigger signal at the same time. 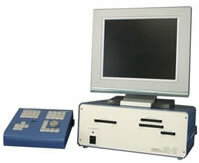 Video patterns and drive signals are edited with personal computer and write to the OEL-10 with Ethernet, USB flash ROM or floppy disk. Copyright (C) 2012 MECC CO., LTD.　All Rights Reserved.